It’s great to be back at here on campus. It’s an honor to have been invited; it’s an honor to hold a degree from Berkeley. It’s an honor to look out on the next generation of Golden Bears. When you return to a place of intense memories, you think it’s the place that has changed so much. But in truth, you are the one who has changed much more. Your memories will be vivid, things will look a little different, but feel very much the same. When you return to Berkeley, you will have changed — and, in turn, you will have changed the world. Before I really begin, let me just remind you tomorrow is Mother’s Day — all of you Mothers out there: The graduates might be the stars today, but just know that they would not shine as brightly if it were not for you. I say to all you graduates: If at first you don’t succeed … do it like your Mom told you to do it. That might be the best advice I give you today. I walked across this stage in 1982. That year, the computer was Time magazine’s Person of the Year. That quote is from that article. Computers were just entering the mainstream, big blocky contraptions, lugged into houses and plunked down on desks. Most of America had no idea the power in those machines. But, most Americans started to find they suddenly had more time for dreams. Even in their wildest dreams, though, there is no way they thought that 30 years later, their children, their grandchildren, would carry something exponentially more powerful with them, everywhere they go, on their laps, in their pockets — digital connections forged among millions around the world, tethered together at all times in a form of worldwide community. Computers obviously gave me time to dream, too. Back then, back when I was, like you, going to the Greek Theatre before Stanford games and wandering up and down Telegraph, it felt like a new world was being imagined right here on campus, in all the different labs and workshops and dorms. There was something in the air that made you think — something that made you dream. And today, I feel that again. Just the other day, I saw video of a Berkeley student who totally automated his dorm room, his lights, his refrigerator, his TV, everything powered from his pocket. The “Romantic Mode” mirror ball was a nice touch, I might add. That’s just one small-scale example, obviously. But the energy here is similar to the energy 30 years ago, and 30 years before that … and before that, going back generations. That’s what’s so special about this place. A place committed to personal liberty and free expression. A place where humanism and science coexist–and even feed off each other, in service of a better day. Twenty-two Nobel laureates … Olympic gold medalists … a Supreme Court chief justice and a secretary of defense … writers, artists, business pioneers, Oscar winners … even the reigning NFL MVP. They all roamed this beautiful campus and left to make their mark on the culture, on society, on the world. And, now … you follow them. Yes, you, sitting there now, baking in the sun, possibly nursing a hangover, thinking, My God — that’s a lot of pressure. What can I do? What can I dream? Well, that’s your question to answer. I can’t do it for you. But, here’s what I know. I know one thing for certain: No graduating class gets to choose the world they graduate into — just like you don’t get to choose your parents and siblings! Every class has its own unique challenges. Every class enters a history that, up to that point, is being written for it. This is no different. What is different, though, is the chance each generation has to take that history and write it larger — or, in my business, to program it better. And on that score, your generation’s opportunities are greater than any generation’s in modern history. You can write the code for all of us. You’re connecting to each other in ways those who came before you could never dream of. And you’re using those connections to strengthen the invisible ties that hold humanity together, and to deepen our understanding of the world around us. You are emblems of the sense of possibility that will define our new age. In the past, it’s always older generations, standing up on high, trying to teach the next generation the ways of the world — trying to make sure they follow in their footsteps. Well, graduates — I’ll admit, it’s different today. You’re, quite simply, teaching us. This generation — your generation — is the first fully connected generation the world has ever known. What’s the first thing you do when you get up? Check your phone? Your laptop? Read some email, comb through your social networks? If you are awake, you are online. You are connected. Some of you are probably texting your friends right now. Tweeting this speech. Changing your status. Smile, you’re on camera. There’s this joke about the college kid getting mugged, who says, “Hold on — let me update my status, letting my friends know I’m getting mugged, then you can have my phone.” This is ridiculous, obviously. But it’s also telling — a stark depiction of just how essential technology has become to your generation’s identity and your ability to connect with the world. Identity and connection — concepts as old as humanity itself — define so much of who we are now. They shape our times, define the human condition. Identity and connection — it is your task to take those timeworn concepts, spin them around, reimagine them, make them fresh and new and exciting. Berkeley helped build that platform for all of us. I know it’s daunting. I know it’s not a great economy to be walking off this stage into. I know all this. But I know you have an advantage — a competitive edge — you have an innate mastery of technology, an ability to build and foster connections that no generation before you ever possessed. People bemoan a generation who grew up living life in front of screens, always connected to something or someone. Those people are wrong. The fact that we are all connected now is a blessing, not a curse, and we can solve many problems in the world as a result. Not only is it an advantage you have; it’s a responsibility you carry. Today, there are 54 wars and conflicts raging around the world. 1.5 billion people live on less than $1 a day, and hundreds of millions of children will go to bed hungry tonight. Nearly half the world’s people don’t live under democratic governments — the rights we all enjoy are a rarity, not a norm. And when it comes to the Internet, we think “everyone” is online. But only 1 billion people have smartphones, and only 2 billion have access to the web today. For most of the world, Internet cafes are like digital oases in technological deserts. But in this century, there is a chance for change on the horizon. The spread of mobile phones and new forms of connectivity offers us the prospect of connecting every community in our lifetime. Yes, it’s true, we have all this knowledge literally at our fingertips. But, just because we know much more than we used to doesn’t mean our problems just go away. The future doesn’t just happen. It’s not etched or written or coded anywhere. There’s no algorithm or formula that says technology will do X, so Y is sure to happen. Technology doesn’t work on its own. It’s just a tool. You are the ones who harness its power. And that requires innovation and entrepreneurship. Entrepreneurship is the lifeblood of a new economy, and a more prosperous society, the engine that keeps communities growing. Two-thirds of the new jobs created are in small businesses, and you all should try now to create a small business… or be part of one… and, of course, I would recommend you use all of what Google has to offer to set it up. You all have a chance to make an original contribution. Don’t just be a shepherd following someone else’s vision and ideas — new models, new forms, new thinking — that’s what the world needs. You don’t need to become an aid worker or a teacher (though, I obviously applaud those who do). You don’t need to be an engineer (though, I’m pretty sure I’d support that, too). Everyone — all of you — can make their mark by creating new standards of brilliance and innovation. And, those standards can spread — can scale — in ways once unimaginable. The collective intelligence of our society, our version of the Borg, is really quite different. Think of it as a new society, with mostly American norms and values, that crosses continents and unites all of us. The empowerment of each of us empowers all of us; and the distinctive feature of your new world is that you can be unique while being completely connected. That, to me, more than anything else, is really the American dream. Now, don’t get me wrong: I believe fully in the power of technology to change the world for the better. And I believe even more fully in the ability of your generation to use that power to great effect — to rule technology. But you can’t let technology rule you. Remember to take at least one hour a day and turn off your devices. Shut it down. Learn where the OFF button is. Take your eyes off the screen, and look into the eyes of the person you love. Have a conversation — a real conversation — with the friends who make you think, with the family who makes you laugh. Engage with the world around you, feel and taste and smell and hug what’s there, right in front of you — and not what’s a click away. Life is not lived in the glow of a monitor. Life is not a series of status updates. Life is about who you love, how you live, it’s about who you travel through the world with. Your family, your collaborators, your friends. Life is a social experience first, and the best aspects of that experience are not lonely ones — they are spent in the company of others. Our landscape has changed, yes, but our humanity will always remain, and that, above all else, is what makes us who we are. And who YOU are is a proud, talented group of Golden Bears. 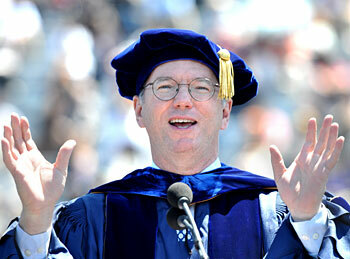 At Berkeley you have all come to know extraordinary people. Look around — a few years ago you started off on the road to adventure with these people, knowing them as boys and girls, wandering around campus, dazed and overwhelmed. Now you are all extraordinary men and women, in total control of your destinies, ready to make your mark not on history, but on the future. At times it may have seemed like the road ahead was an impossible slog. But today you have made it. And the friendships you forged when the times were good, when the times were bad — and when you realized you just overslept your lecture — those are the friendships that will matter for life. The people you have met at Berkeley will be some of the strongest friends and closest allies you will ever meet in your lives. It’s been that way for me. When you leave here, don’t leave them behind. Stay close and stay strong. Take them with you, and go and change the world, together. I ask each of you … Find a way to say “Yes” to things. Say yes to invitations to a new country, say yes to meet new friends, say yes to learning a new language, picking up a new sport. Yes is how you get your first job, and your next job. Yes is how you find your spouse, and even your kids. Even if is a bit edgy, a bit out of your comfort zone, saying yes means that you will do something new, meet someone new, and make a difference in your life, and likely in others’ lives as well. Yes lets you stand out in a crowd, to be the optimist, to stay positive, to be the one everyone comes to for help, for advice, or just for fun. Yes is what keeps us all young. Yes is a tiny word that can do big things. Say it often. Do not be afraid to fail. And DO NOT be afraid to succeed. For those who say you’re thinking too big … be smart enough not to listen. For those who say the odds are too small … be dumb enough to give it a shot. And for those who ask, how can you do that?… look them in the eyes and say, I’ll figure it out. I for one am happy to have you join us as adults, and the quicker we can have you lead, the better. Time to throw out all us aging baby boomers and replace us with those best-equipped to lead us into a new age, march us all to a better day. That Time article about the computer in 1982 was called “A New Day Dawns.” That day has long since faded into dusk. We need a new day to dawn, now, today. The power and possibility — the intellectual energy and human electricity — seated in this stadium, and in stadiums and auditoriums like this around the country–your generation will break a new day. Your vast knowledge will seed a new era. Your bold ideas will shape a new reality. Your agile minds will inspire a new dawn. You’ve got this thing in your pocket with all this power. Exponentially more so than in 1982, YOU have got time for dreams. So … I ask you, class of ‘12, what will you dream?